The series was mainly produced by David Heyman, and stars Daniel Radcliffe, Rupert Grint, and Emma Watson as the three leading characters: Harry Potter, Ron Weasley, and Hermione Granger. Four directors worked on the series: Chris Columbus, Alfonso Cuarón, Mike Newell, and David Yates. Michael Goldenberg wrote the screenplay for Harry Potter and the Order of the Phoenix (2007), while the remaining films had their screenplays written by Steve Kloves. Production took place over ten years, with the main story arc following Harry Potter's quest to overcome his arch-enemy Lord Voldemort. Harry Potter and the Deathly Hallows, the seventh and final novel in the series, was adapted into two feature-length parts. Part 1 was released in November 2010, and Part 2 was released in July 2011. Five of the series' eight films are among the 50 highest-grossing films of all time, with Harry Potter and the Deathly Hallows – Part 2 the highest-grossing film in the series and one of 36 films to gross over $1 billion, ranking at number ten. Without inflation adjustment, it is the third highest-grossing film series with $7.7 billion in worldwide receipts. Late in 1997, film producer David Heyman's London offices received a copy of the first book in what would become Rowling's series of seven Harry Potter novels. The book, Harry Potter and the Philosopher's Stone, was relegated to a low-priority bookshelf, where it was discovered by a secretary who read it and gave it to Heyman with a positive review. Consequently, Heyman, who had originally disliked "the rubbish title", read the book himself. Highly impressed by Rowling's work, he began the process that led to one of the most successful cinematic franchises of all time. Heyman's enthusiasm led to Rowling's 1999 sale of the film rights for the first four Harry Potter books to Warner Bros. for a reported £1 million (US$2,000,000). A demand Rowling made was that the principal cast be kept strictly British, allowing nevertheless for the inclusion of many Irish actors, such as Richard Harris as Dumbledore, and for casting of French and Eastern European actors in Harry Potter and the Goblet of Fire where characters from the book are specified as such. Rowling was hesitant to sell the rights because she "didn't want to give them control over the rest of the story" by selling the rights to the characters, which would have enabled Warner Bros. to make non-author-written sequels. Although Steven Spielberg initially negotiated to direct the first film, he declined the offer. Spielberg wanted the adaptation to be an animated film, with American actor Haley Joel Osment providing Harry Potter's voice. [not in citation given] Spielberg contended that, in his opinion, there was every expectation of profit in making the film. He claims that making money would have been like "shooting ducks in a barrel. It's just a slam dunk. It's just like withdrawing a billion dollars and putting it into your personal bank accounts. There's no challenge". In the "Rubbish Bin" section of her website, Rowling maintains that she had no role in choosing directors for the films, writing "Anyone who thinks I could (or would) have 'veto-ed' him [Spielberg] needs their Quick-Quotes Quill serviced." After Spielberg left, conversations began with other directors, including Chris Columbus, Jonathan Demme, Terry Gilliam, Mike Newell, Alan Parker, Wolfgang Petersen, Rob Reiner, Tim Robbins, Brad Silberling, and Peter Weir. Petersen and Reiner both pulled out of the running in March 2000. It was then narrowed down to Columbus, Gilliam, Parker, and Silberling. Rowling's first choice was Terry Gilliam. However, on 28 March 2000 Columbus was appointed as director of the film, with Warner Bros. citing his work on other family films such as Home Alone and Mrs. Doubtfire as influences for their decision. Harry Potter is the kind of timeless literary achievement that comes around once in a lifetime. Since the books have generated such a passionate following across the world, it was important to us to find a director that has an affinity for both children and magic. I can't think of anyone more ideally suited for this job than Chris [Columbus]. —  Lorenzo di Bonaventura, Warner Bros.
Steve Kloves was selected to write the screenplay for the first film. He described adapting the book as "tough" since it did not "lend itself to adaptation as well as the next two books". Kloves was sent a "raft" of synopses of books proposed as film adaptations, with Harry Potter being the only one that jumped out at him. He went out and bought the book, becoming an instant fan. When speaking to Warner Bros. he stated that the film had to be British and true to the characters. David Heyman was confirmed to produce the film. Rowling received a large amount of creative control for the film, an arrangement that Columbus did not mind. Warner Bros. had initially planned to release the first film over the 4 July 2001 weekend, making for such a short production window that several of the originally proposed directors had withdrawn themselves from contention. Eventually, due to time constraints, the date was put back to 16 November 2001. In 2000, after a seven-month search, lead actor Daniel Radcliffe was discovered by producer David Heyman and writer Steve Kloves seated just behind them in a theatre. In Heyman's own words, "There sitting behind me was this boy with these big blue eyes. It was Dan Radcliffe. I remember my first impressions: He was curious and funny and so energetic. There was real generosity too, and sweetness. But at the same time he was really voracious and with hunger for knowledge of whatever kind." Radcliffe had already established himself as an actor in the 1999 BBC television production of David Copperfield in which he played the title role's childhood years. Heyman persuaded Radcliffe's parents to allow him to audition for the part of Harry Potter, which involved Radcliffe being filmed. (This screen test footage was released via the first set of Ultimate Editions in 2009.) Rowling was enthusiastic after viewing Radcliffe's filmed test, saying she didn't think there was a better choice for the part of Harry Potter. Also in 2000, the then unknown British actors Emma Watson and Rupert Grint were selected from thousands of auditioning children to play the roles of Hermione Granger and Ron Weasley, respectively. Their only previous acting experience was in school plays. Grint was eleven years old and Watson ten at the time they were cast. Los Angeles Times writer Geoff Boucher, who conducted the above-mentioned interview with Heyman, added that the casting of the three major roles "is especially impressive in hindsight. The trio's selection was arguably one of the best show-business decisions over the past decade... they have shown admirable grace and steadiness in the face of teen superstardom." Filming of the series began at Leavesden Studios, Hertfordshire, England, in September 2000 and ended in December 2010, with post-production on the final film lasting until summer 2011. Leavesden Studios was the main base for filming Harry Potter, and it opened to the public as a studio tour in 2012 (renamed as Warner Bros. Studios, Leavesden). David Heyman produced all the films in the series with his production company Heyday Films, while David Barron joined the series as an executive producer on Chamber of Secrets and Goblet of Fire. Barron was later appointed producer on the last four films. Chris Columbus was an executive producer on the first two films alongside Mark Radcliffe and Michael Barnathan, but he became a producer on the third film alongside Heyman and Radcliffe. Other executive producers include Tanya Seghatchian and Lionel Wigram. J. K. Rowling, author of the series, was asked to become a producer on Goblet of Fire but declined. She subsequently accepted the role on the two-part Deathly Hallows. Heyday Films and Columbus' company 1492 Pictures collaborated with Duncan Henderson Productions in 2001, Miracle Productions in 2002, and P of A Productions in 2004. Even though Prisoner of Azkaban was the final film produced by 1492 Pictures, Heyday Films continued with the franchise and collaborated with Patalex IV Productions in 2005. The sixth film in the series, Half-Blood Prince, was the most expensive film to produce as of 2009[update]. Warner Bros. split the seventh and final novel in the series, Deathly Hallows, into two cinematic parts. The two parts were filmed back-to-back from early 2009 to summer 2010, with the completion of reshoots taking place on 21 December 2010; this marked the end of filming Harry Potter. Heyman stated that Deathly Hallows was "shot as one film" but released in two feature-length parts. Tim Burke, the visual effects supervisor of the series, said of the production on Harry Potter, "It was this huge family; I think there were over 700 people working at Leavesden, an industry in itself." David Heyman said, "When the first film opened, no way did I think we'd make eight films. That didn't seem feasible until after we'd done the fourth." Nisha Parti, the production consultant on the first film, said that Heyman "made the first film very much the way he felt the studio Warner Bros. wanted to make it." After the film's success, Heyman was given "more freedom". One of the aims of the filmmakers from the beginning of production was to develop the maturity of the films. Chris Columbus stated, "We realised that these movies would get progressively darker. Again, we didn't know how dark but we realised that as the kids get older, the movies get a little edgier and darker." This transpired with the succeeding three directors who would work on the series in the following years, with the films beginning to deal with issues such as death, betrayal, prejudice, and political corruption as the series developed narratively and thematically. After Chris Columbus had finished working on Harry Potter and the Philosopher's Stone, he was hired to direct the second film, Harry Potter and the Chamber of Secrets. The production started within a week after the release of the first film. Columbus was set to direct all entries in the series, but he did not want to return for the third film, Harry Potter and the Prisoner of Azkaban, claiming he was "burned out". He moved to the position of producer, while Alfonso Cuarón was approached for the role of director. He was initially nervous about directing the instalment since he had not read any of the books or seen the films. After reading the series, he changed his mind and signed on to direct since he had immediately connected to the story. Because Cuarón decided not to direct the fourth instalment, Harry Potter and the Goblet of Fire, a new director had to be selected. Mike Newell was chosen to direct the film, but he declined to direct the next film, Harry Potter and the Order of the Phoenix, which was given to David Yates, who also directed Harry Potter and the Half-Blood Prince and Harry Potter and the Deathly Hallows, becoming the only director to helm more than one film since Chris Columbus. Chris Columbus said his vision of the first two films was of a "golden storybook, an old-fashioned look", while Alfonso Cuarón changed the visual tone of the series, desaturated the colour palette, and expanded the landscape around Hogwarts. Mike Newell decided to direct the fourth film as a "paranoid thriller", while David Yates wanted to "bring a sense of jeopardy and character to the world". Cuarón, Newell, and Yates have said that their challenge was striking a balance between making the films according to their individual vision, while working within a cinematic world already established by Columbus. David Heyman commented on the "generosity of the directors" by revealing that "Chris spent time with Alfonso, Alfonso spent time with Mike and Mike spent time with David, showing him an early cut of the film, talking through what it means to be a director and how they went about [making the films]." David Heyman also said, "I suppose Chris Columbus was the most conservative choice from the studio's point of view. But he expressed real passion." Producer Tanya Seghatchian said they were "more adventurous" in choosing a director for the third film and went straight to Alfonso Cuarón. Mike Newell became the first British director of the series when he was chosen for the fourth film; Newell was considered to direct the first film before he dropped out. David Yates directed the final films after David Heyman thought him capable of handling the edgy, emotional, and political material of the later novels. All the directors have been supportive of each other. Chris Columbus praised the character development in the films, while Alfonso Cuarón admired the "quiet poetry" of David Yates' films. Mike Newell noted that each director had a different heroism, and David Yates views the first four films "respectfully and enjoy[s] them." Daniel Radcliffe said Yates "took the charm of the films that Chris made and the visual flair of everything that Alfonso did and the thoroughly British, bombastic nature of the film directed by Mike Newell" and added "his own sense" of realism. Steve Kloves wrote the screenplays for all but the fifth film, which was penned by Michael Goldenberg. Kloves had direct assistance from J.K. Rowling, though she allowed him what he described as "tremendous elbow room". Rowling asked Kloves to remain faithful to the spirit of the books; thus, the plot and tone of each film and its corresponding book are virtually the same, albeit with some changes and omissions for purposes of cinematic style, time, and budget constraints. Michael Goldenberg also received input from Rowling during his adaptation of the fifth novel; Goldenberg was originally considered to adapt the first novel before the studio chose Kloves. In a 2010 interview, David Heyman briefly explained the book-to-film transition. He commented on Rowling's involvement in the series, stating that she understood that "books and films are different" and was "the best support" a producer could have. Rowling had overall approval on the scripts, which were viewed and discussed by the director and the producers. Heyman also said that Kloves was the "key voice" in the process of adapting the novels and that certain aspects from the books needed to have been excluded from the scripts due to the filmmakers' decision to keep the main focus on Harry's journey as a character, which would ultimately give the films a defined structure. Heyman mentioned that some fans "don't necessarily understand the adaptation process" and that the filmmakers would have loved to "have everything" from the books in the films but noted that it was not possible since they had "neither time nor cinematic structure" to do so. He finished by saying that adapting a novel to the screen is "a really considered process." Because the films were being made as the novels were being published, the filmmakers had no idea of the story's outcome until the release of the final novel in 2007. Kloves spoke of his relationship with Rowling when adapting the novels by saying, "The thing is about Jo, which is remarkable for someone who had no experience with the filmmaking process, was her intuition. We had a conversation the very first day I met her where she said, 'I know the movies can't be the books... because I know what's coming and it's impossible to fully dramatise on screen what I'm going to write. But I just ask you to be true to the characters; that's all I care about.'" Kloves also said, "I don't know what compelled me to say this [to Rowling], but I said, 'I've just got to warn you my favourite character is not Harry. My favourite character is Hermione.' And I think for some weird reason, from that moment on, she sort of trusted me." Aside from the three lead actors, other notable cast members include Robbie Coltrane as Rubeus Hagrid, Tom Felton as Draco Malfoy, Alan Rickman as Severus Snape, and Dame Maggie Smith as Minerva McGonagall. Richard Harris, who played the role of Professor Albus Dumbledore, died on 25 October 2002 causing the role to be re-cast for the third instalment, Harry Potter and the Prisoner of Azkaban. David Heyman and director Alfonso Cuarón chose Michael Gambon to portray the character of Dumbledore, which he did for all succeeding films. Notable recurring cast members include Helena Bonham Carter as Bellatrix Lestrange, Warwick Davis as Filius Flitwick, Ralph Fiennes as Lord Voldemort, Brendan Gleeson as Alastor Moody, Richard Griffiths as Vernon Dursley, Jason Isaacs as Lucius Malfoy, Gary Oldman as Sirius Black, Fiona Shaw as Petunia Dursley, Timothy Spall as Peter Pettigrew, David Thewlis as Remus Lupin, Emma Thompson as Sybill Trelawney, Mark Williams as Arthur Weasley, and Julie Walters as Molly Weasley. The series has seen many returning crew members from various departments, including Tim Burke, visual effects supervisor; Peter Doyle, digital film colourist; Nick Dudman, make-up and creature effects designer; David Holmes, stunt double; Amanda Knight, make-up artist; Stephenie McMillan, set designer; Greg Powell, stunt coordinator; Jany Temime, costume designer; and Fiona Weir, casting director. 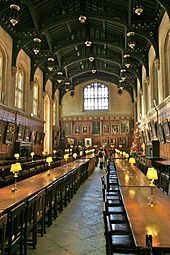 The Hall of Christ Church in Oxford, England, the inspiration for the studio film set of The Great Hall of Hogwarts. The production designer for all eight films is Stuart Craig. Assisted by Stephenie McMillan, Craig has created iconic sets pieces including the Ministry of Magic, the Chamber of Secrets, Malfoy Manor, and the layout for the CGI Horcrux Cave. Because the novels were being published as the films were being made, Craig was required to rebuild some sets for future films and alter the design of Hogwarts. The studio film set of The Great Hall of Hogwarts was one of the first sets ever created for the series. He said, "In the early days, every time you saw the exterior of Hogwarts, it was a physical miniature," which was made by craftsmen and occupied a large sound stage. "We ended up with a profile of how Hogwarts looked, a skyline that actually I didn't design, and it wasn't always satisfactory, and as all the novels got written and movies got made there were new requirements [for buildings]. The [Astronomy Tower] definitely wasn't there originally, and so we were able to add that substantial piece. And in the last film, we needed an arena for the battle for Hogwarts – the big courtyard outside doubled in size, and if you look at the first movie it wasn't there at all. There were quite some liberties taken with the continuity of Hogwarts." In the last film, Craig used a digital model instead of a miniature to "embrace the latest technology". On the method of creating the sets, Craig said he often started by sketching ideas onto a blank sheet of paper. Stephanie McMillan also said that "each film always had plenty of new challenges," citing the changes in visual style between directors and cinematographers as an example, along with the developing story in the novels. Due to J.K. Rowling's descriptions of various settings in the novels, Craig noted his "responsibility was to place it together". Craig commented on his experience working in the studio environment: "I'm the production designer, but on a big movie like Harry Potter I may be responsible for 30 to 35 people; from the supervising art director, and a team of art directors and assistants, to draughtsmen and junior draughtsmen, and then on to model makers, sculptors and scenic artists." He said, "Ten years ago, all the Harry Potter drawings were done in pencil. I would take my roughs and plans and sections and give them to a professional architectural illustrator, who would create concept art using pencil and colour wash on watercolour paper." He said the process changed slightly throughout the years due to, what he called, the "digital revolution" of making films. 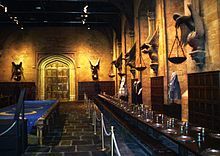 When filming of the series was completed, some of Craig's sets had to be rebuilt or transported for them to be displayed at the Warner Bros. studio tour. Six directors of photography worked on the series: John Seale on the first film, Roger Pratt on the second and fourth, Michael Seresin on the third, Sławomir Idziak on the fifth, Bruno Delbonnel on the sixth, and Eduardo Serra on the seventh and eighth. Delbonnel was considered to return for both parts of Deathly Hallows, but he declined, stating that he was "scared of repeating" himself. Delbonnel's cinematography in Half-Blood Prince gained the series its only Academy Award nomination for Best Cinematography. As the series progressed, each cinematographer faced the challenge of shooting and lighting older sets (which had been around since the first few films) in unique and different ways. Chris Columbus said the series' vivid colouring decreased as each film was made. Michael Seresin commented on the change of visual style from the first two films to Prisoner of Azkaban: "The lighting is moodier, with more shadowing and cross-lighting." Seresin and Alfonso Cuarón moved away from the strongly coloured and brightly lit cinematography of the first two films, with dimmer lighting and a more muted colour palette being utilised for the succeeding five films. After comparing a range of digital cameras with 35 mm film, Bruno Delbonnel decided to shoot the sixth movie, Half-Blood Prince, on film rather than the increasingly popular digital format. This decision was kept for the two-part Deathly Hallows with Eduardo Serra, who said that he preferred to work with film because it was "more technically accurate and dependable". Because the majority of Deathly Hallows takes place in various settings away from Hogwarts, David Yates wanted to "shake things up" by using different photographic techniques such as using hand-held cameras and very wide camera lenses. Eduardo Serra said, "Sometimes we are combining elements shot by the main unit, a second unit, and the visual effects unit. You have to know what is being captured – colours, contrast, et cetera – with mathematical precision." He noted that with Stuart Craig's "amazing sets and the story", the filmmakers could not "stray too far from the look of the previous Harry Potter films." Along with continuous changes in cinematographers, there have been five film editors to work in post-production on the series: Richard Francis-Bruce edited the first instalment, Peter Honess the second, Steven Weisberg the third, Mick Audsley the fourth, and Mark Day films five through eight. 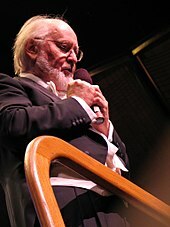 John Williams scored the first three films and received Academy Award nominations for the first and third films. The Harry Potter series has had four composers. John Williams scored the first three films: Philosopher's Stone, Chamber of Secrets, and Prisoner of Azkaban. However, the second entry was adapted and conducted by William Ross due to Williams's conflicting commitments. Williams also created Hedwig's Theme, which is used in every film in the series. After Williams left the series to pursue other projects, Patrick Doyle scored the fourth entry, Goblet of Fire, which was directed by Mike Newell, with whom Doyle had worked previously. In 2006, Nicholas Hooper started work on the score to Order of the Phoenix by reuniting with director David Yates. Hooper also composed the soundtrack to Half-Blood Prince but decided not to return for the final films. In January 2010, Alexandre Desplat was confirmed to compose the score for Harry Potter and the Deathly Hallows – Part 1. The film's orchestration started in the summer with Conrad Pope, the orchestrator on the first three Harry Potter films, collaborating with Desplat. Pope commented that the music "reminds one of the old days." Desplat returned to score Harry Potter and the Deathly Hallows – Part 2 in 2011. Director David Yates stated that he wanted John Williams to return to the series for the final installment, but their schedules did not align due to the urgent demand for a rough cut of the film. The final recording sessions of Harry Potter took place on 27 May 2011 at Abbey Road Studios with the London Symphony Orchestra, orchestrator Conrad Pope, and composer Alexandre Desplat. Doyle, Hooper, and Desplat introduced their own personal themes to their respective soundtracks, while keeping a few of John Williams's themes. There have been many visual effects companies to work on the Harry Potter series. Some of these include Rising Sun Pictures, Sony Pictures Imageworks, Double Negative, Cinesite, Framestore, and Industrial Light & Magic. The latter three have worked on all the films in the series, while Double Negative and Rising Sun Pictures began their commitments with Prisoner of Azkaban and Goblet of Fire, respectively. Framestore contributed by developing many memorable creatures and sequences to the series. Cinesite was involved in producing both miniature and digital effects for the films. Producer David Barron said that "Harry Potter created the UK effects industry as we know it. On the first film, all the complicated visual effects were done on the [US] west coast. But on the second, we took a leap of faith and gave much of what would normally be given to Californian vendors to UK ones. They came up trumps." Tim Burke, the visual effects supervisor, said many studios "are bringing their work to UK effects companies. Every facility is fully booked, and that wasn't the case before Harry Potter. That's really significant." On 12 June 2010, filming of the Deathly Hallows – Part 1 and Deathly Hallows – Part 2 was completed with actor Warwick Davis stating on his Twitter account, "The end of an Era – today is officially the last day of principal photography on 'Harry Potter' – ever. I feel honoured to be here as the director shouts cut for the very last time. Farewell Harry & Hogwarts, it's been magic!". However, reshoots of the epilogue scene were confirmed to begin in the winter of 2010. The filming was completed on 21 December 2010, marking the official closure of filming the Harry Potter franchise. Exactly four years earlier on that day, author J. K. Rowling's official website revealed the title of the final novel in the series – Harry Potter and the Deathly Hallows. The Gryffindor Common Room was introduced in the first film. Harry Potter is an orphaned boy brought up by his unkind Muggle (non-magical) aunt and uncle. At the age of eleven, half-giant Rubeus Hagrid informs him that he is actually a wizard and that his parents were murdered by an evil wizard named Lord Voldemort. Voldemort also attempted to kill one-year-old Harry on the same night, but his killing curse mysteriously rebounded and reduced him to a weak and helpless form. Harry became extremely famous in the Wizarding World as a result. Harry begins his first year at Hogwarts School of Witchcraft and Wizardry and learns about magic. During the year, Harry and his friends Ron Weasley and Hermione Granger become entangled in the mystery of the Philosopher's Stone which is being kept within the school. The Riddles' Gravestone from Lord Voldemort's rebirth scene in the fourth film. The rights for the first four novels in the series were sold to Warner Bros. for £1,000,000 by J.K. Rowling. After the release of the fourth book in July 2000, the first film, Harry Potter and the Philosopher's Stone, was released on 16 November 2001. In its opening weekend, the film grossed $90 million in the United States alone, which set a record opening worldwide. The succeeding three motion picture adaptations followed suit in financial success, while garnering positive reviews from fans and critics. The fifth film, Harry Potter and the Order of the Phoenix, was released by Warner Bros. on 11 July 2007 in English-speaking countries, except for the UK and Ireland, which released the movie on 12 July. The sixth, Harry Potter and the Half-Blood Prince, was released on 15 July 2009 to critical acclaim and finished its theatrical run ranked as the number two grossing film of 2009 on the worldwide charts. The final novel, Harry Potter and the Deathly Hallows, was split into two cinematic parts: Part 1 was released on 19 November 2010, and Part 2, the conclusion to both the final film and the series, was released on 15 July 2011. Part 1 was originally scheduled to be released in 3D and 2D, but due to a delay in the 3D conversion process, Warner Bros. released the film only in 2D and IMAX cinemas. However, Part 2 was released in 2D and 3D cinemas as originally planned. The television broadcast rights for the series in the United States are currently held by NBCUniversal, which typically airs the films on USA Network and Syfy. The film series has accrued nearly 1.3 billion viewings since its television debut—the highest-watched franchise in television broadcast history. All the films have been a success financially and critically, making the franchise one of the major Hollywood "tent-poles" akin to James Bond, Star Wars, Indiana Jones and Pirates of the Caribbean. The series is noted by audiences for growing visually darker and more mature as each film was released. However, opinions of the films generally divide book fans, with some preferring the more faithful approach of the first two films and others preferring the more stylised character-driven approach of the later films. Some also feel the series has a "disjointed" feel due to the changes in directors, as well as Michael Gambon's interpretation of Albus Dumbledore differing from that of Richard Harris. Author J. K. Rowling has been constantly supportive of the films, and evaluated Deathly Hallows as her favourite one in the series. She wrote on her website of the changes in the book-to-film transition, "It is simply impossible to incorporate every one of my storylines into a film that has to be kept under four hours long. Obviously films have restrictions – novels do not have constraints of time and budget; I can create dazzling effects relying on nothing but the interaction of my own and my readers' imaginations". At the 64th British Academy Film Awards in February 2011, J. K. Rowling, David Heyman, David Barron, David Yates, Alfonso Cuarón, Mike Newell, Rupert Grint and Emma Watson collected the Michael Balcon Award for Outstanding British Contribution to Cinema for the series. Harry Potter was also recognised by the BAFTA Los Angeles Britannia Awards, with David Yates winning the Britannia Award for Artistic Excellence in Directing for his four Harry Potter films. Six of the eight films were nominated for a total of 12 Academy Awards. Some critics, fans, and general audiences have expressed disappointment that the Harry Potter series did not win any Oscars for its achievements. However, others have pointed out that certain films in the series had uneven reviews, in contrast to the three films of The Lord of the Rings, for example, which were all critically acclaimed. This has been partially attributed to the Harry Potter franchise going through several directors with their own styles in contrast to the Lord of the Rings trilogy, which was filmed in one massive undertaking by the same director, writer, and producer. Although not successful at the Oscars, the Harry Potter series has gained success in many other award ceremonies, including the annual Saturn Awards and Art Directors Guild Awards. The series has also gained a total of 24 nominations at the British Academy Film Awards presented at the annual BAFTAs, winning several, and 5 nominations at the Grammy Awards. 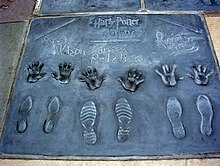 Radcliffe, Grint, and Watson were honored outside Grauman's Chinese Theatre at the Hand, Foot, and Wand Ceremony, Hollywood Walk of Fame, July 2007. Philosopher's Stone achieved seven BAFTA Award nominations, including Best British Film and Best Supporting Actor for Robbie Coltrane. The film was also nominated for eight Saturn Awards and won for its costumes design. It was also nominated at the Art Directors Guild Awards for its production design and received the Broadcast Film Critics Award for Best Live Action Family Film along with gaining two other nominations. Chamber of Secrets won the award for Best Live Action Family Film in the Phoenix Film Critics Society. It was nominated for seven Saturn Awards, including Best Director and Best Fantasy Film. The film was nominated for four BAFTA Awards and a Grammy Award for John Williams's score. Prisoner of Azkaban won an Audience Award, as well as Best Feature Film, at the BAFTA Awards. The film also won a BMI Film Music award along with being nominated at the Grammy Awards, Visual Effect Society Awards, and the Amanda Awards. Goblet of Fire won a BAFTA award for Best Production Design as well as being nominated at the Saturn Awards, Critic's Choice Awards, and the Visual Effects Society Awards. Order of the Phoenix picked up three awards at the inaugural ITV National Movie Awards. At the Empire Awards, David Yates won Best Director. Composer Nicholas Hooper received a nomination for a World Soundtrack Discovery Award. The film was nominated at the BAFTA Awards, but did not win for Best Production Design or Best Special Visual Effects. Half-Blood Prince was nominated for BAFTA Awards in Production Design and Visual Effects, and it was in the longlists for several other categories, including Best Supporting Actor for Alan Rickman. Amongst other nominations and wins, the film also achieved Best Family Movie at the National Movie Awards as well as Best Live Action Family Film at the Phoenix Film Critics Society Awards, along with being nominated for Best Motion Picture at the Satellite Awards. Deathly Hallows – Part 1 gained two nominations at the BAFTA Awards for Best Make-Up and Hair and Best Visual Effects, along with receiving nominations for the same categories at the Broadcast Film Critics Association Awards. Eduardo Serra's cinematography and Stuart Craig's production design were also nominated in various award ceremonies, and David Yates attained his second win at the Empire Awards, this time for Best Fantasy Film. He also obtained another Best Director nomination at the annual Saturn Awards, which also saw the film gain a Best Fantasy Film nomination. Deathly Hallows – Part 2 was released to critical acclaim, gaining a mix of audience awards. Part 2 of Deathly Hallows was also recognised at the Saturn Awards as well as the BAFTA Awards, where the film achieved a win for Best Special Visual Effects. As of 2018[update], the Harry Potter film series is the 3rd highest-grossing film franchise of all time, with the eight films released grossing over $7.7 billion worldwide. Without adjusting for inflation, this is higher than the first 22 James Bond films and the six films in the Star Wars franchise. Chris Columbus's Philosopher's Stone became the highest-grossing Harry Potter film worldwide upon completing its theatrical run in 2002, but it was eventually topped by David Yates's Deathly Hallows – Part 2, while Alfonso Cuarón's Prisoner of Azkaban grossed the least. Six films in the Harry Potter franchise — Harry Potter and the Prisoner of Azkaban, Harry Potter and the Goblet of Fire, Harry Potter and the Order of the Phoenix, Harry Potter and the Half-Blood Prince and Harry Potter and the Deathly Hallows, Parts 1 & 2 — have to date grossed around $216 million in IMAX theaters worldwide. "Harry Potter was in the vanguard of a new approach to big-budget film-making. Most modern blockbuster franchises have two things in common: they are based on known properties such as books and comics, and they are steered by respected but little-known directors." The Harry Potter films and their success have been retrospectively considered to have had a significant impact on the film industry. They are cited as having helped redefine the Hollywood blockbuster in the 21st century by initiating a shift toward established media franchises forming the basis of successful films. In the wake of the final film's release, Claudia Puig of USA Today wrote that the films "inspired every major studio to try to capture [its] alchemic formula, spawning a range of copycats and wannabes" and "also have shown Hollywood how to make a glossy blockbuster with an eye toward keeping costs down." A 2009 article from The Economist argued that the films were "in the vanguard" of adaptations of established properties being the modern film franchise model, citing The Lord of the Rings, Spider-Man and The Dark Knight Trilogy as examples of successful film series that followed Harry Potter's suit. Furthermore, the practice of splitting the finale of a film series into two back-to-back films began with the success of Deathly Hallows, and it would soon be replicated by The Hobbit: The Desolation of Smaug and The Battle of the Five Armies, The Twilight Saga: Breaking Dawn – Parts 1 and 2, The Hunger Games: Mockingjay – Parts 1 and 2, and Avengers: Infinity War and its sequel Avengers: Endgame. The films are also widely credited with singlehandedly signalling the popularity of films based on children's and young adult literature in the 2000s and 2010s, correlating with the book series' own literary influence. Costance Grady and Aja Romano, commenting on the whole Harry Potter franchise's legacy for Vox in light of its 20th anniversary, wrote that youth-targeted literature has since become "a go-to well of ideas for Hollywood," pointing to the successes of The Twilight Saga and The Hunger Games. The series has spawned a vast volume of fan fiction, with nearly 600 thousand inspired stories catalogued. YouTube hosts many fan films, ranging from amateur productions to full-length films. ^ Not including executive producers. ^ Kois, Dan. "The Real Wizard Behind Harry Potter" Slate (magazine), 13 July 2011. Accessed: 20 December 2013. ^ "Fantasy – Live Action". Box Office Mojo. Retrieved 1 June 2011. ^ "Harry Potter". Box Office Mojo. Retrieved 1 June 2011. ^ "Fantastic Beasts release shows the magic in brand reinvention". Campaignlive.co.uk. Retrieved 19 October 2017. ^ a b Dargis, Manohla; Scott, A. O. (15 July 2007). "Harry Potter and the Four Directors". The New York Times. Retrieved 29 July 2011. ^ a b "Harry Potter at Leavesden". WB Studio Tour. Archived from the original on 10 February 2014. Retrieved 16 September 2012. ^ "Warner Bros. Plans Two-Part Film Adaptation of "Harry Potter and the Deathly Hallows" to Be Directed by David Yates". Business Wire. 13 March 2008. Retrieved 6 September 2012. ...expand the screen adaptation of Harry Potter and the Deathly Hallows and release the film in two parts. ^ Boucher, Geoff; Eller, Claudia (7 November 2010). "The end nears for 'Harry Potter' on film". Los Angeles Times. Retrieved 3 January 2010. The fantasy epic begins its Hollywood fade-out Nov. 19 with the release of " Harry Potter and the Deathly Hallows – Part 1" and finishes next summer with the eighth film, "Harry Potter and the Deathly Hallows – Part 2." ^ Schuker, Lauren A. E. (22 November 2010). "'Potter' Charms Aging Audience". The Wall Street Journal. Retrieved 3 January 2010. The seventh instalment in the eight-film franchise, "Harry Potter and the Deathly Hallows: Part I" took in a franchise record of $125.1 million at domestic theaters this weekend according to Warner Bros., the Time Warner Inc.-owned movie studio behind the films. ^ a b c d e "Hero Complex". Los Angeles Times. 20 July 2009. Retrieved 4 May 2010. ^ "WiGBPd About Harry". Australian Financial Review. 19 July 2000. Archived from the original on 4 January 2007. Retrieved 26 May 2007. ^ "Harry Potter and the Philosopher's Stone". The Guardian. UK. 16 November 2001. Retrieved 26 May 2007. ^ Ross, Jonathan, J. K. Rowling (6 July 2007). Friday Night with Jonathan Ross. UK: BBC One. Retrieved 31 July 2007. ^ Linder, Brian (23 February 2000). "No "Harry Potter" for Spielberg". IGN. Archived from the original on 23 November 2007. Retrieved 8 July 2007. ^ Jensen, Jeff (17 March 2000). "Potter's Field". Entertainment Weekly. Retrieved 26 May 2007. ^ "For Spielberg, making a Harry Potter movie would have been no challenge". Hollywood.com. 5 September 2001. Retrieved 26 May 2007. ^ Rowling, J.K. "Rubbish Bin: J. K. Rowling "veto-ed" Steven Spielberg". JKRowling.com. Archived from the original on 8 February 2012. Retrieved 20 July 2007. ^ Schmitz, Greg Dean. "Harry Potter and the Sorcerer's Stone (2001)". Yahoo!. Archived from the original on 15 December 2007. Retrieved 30 May 2007. ^ Linder, Brian (7 March 2000). "Two Potential "Harry Potter" Director's Back Out". IGN. Archived from the original on 2 March 2008. Retrieved 8 July 2007. ^ Davidson, Paul (15 March 2000). "Harry Potter Director Narrowed Down". IGN. Archived from the original on 6 December 2008. Retrieved 8 July 2007. ^ "Terry Gilliam bitter about Potter". Wizard News. 29 August 2005. Retrieved 8 July 2007. ^ a b c Linder, Bran (28 March 2000). "Chris Columbus to Direct Harry Potter". IGN. Archived from the original on 13 January 2008. Retrieved 8 July 2007. ^ Sragow, Michael (24 February 2000). "A Wizard of Hollywood". Salon. Retrieved 8 July 2007. ^ Linder, Brian (30 March 2000). "Chris Columbus Talks Potter". IGN. Archived from the original on 6 December 2008. Retrieved 8 July 2007. ^ Brian Linder (17 May 2000). "Bewitched Warner Bros. Delays Potter". IGN. Retrieved 8 July 2007. ^ "Ultimate Edition: Screen Test, Trio Casting and Finding Harry Potter". Mugglenet.com. Archived from the original on 23 June 2011. Retrieved 19 October 2017. ^ a b "Young Daniel gets Potter part". BBC Online. 21 August 2000. ^ "Daniel Radcliffe, Rupert Grint and Emma Watson bring Harry, Ron and Hermione to life for Warner Bros. Pictures' "Harry Potter and the Sorcerer's Stone"". Warner Brothers. 21 August 2000. Archived from the original on 14 April 2002. Retrieved 26 August 2010. ^ "Warner Bros. Studio Tour London - The Making of Harry Potter". www.wbstudiotour.co.uk. ^ "Warner Bros. Pictures mentions J. K. Rowling as producer". Business Wire. 20 September 2010. Retrieved 2 March 2011. ^ Richards, Olly (14 March 2008). "Potter Producer Talks Deathly Hallows". Empire. Retrieved 14 March 2008. ^ a b c d e Gilbey, Ryan (7 July 2011). "Ten years of making Harry Potter films, by cast and crew". The Guardian. London. Retrieved 12 September 2012. ^ a b c d e "Christopher Columbus Remembers Harry Potter". Empire Online. Retrieved 9 September 2012. We realised that these movies would get progressively darker. Again, we didn't know how dark but we realised that as the kids get older, the movies get a little edgier and darker. ^ "Harry Potter, Dissected". The New York Times. 14 July 2007. Retrieved 17 September 2012. ^ "Chris Columbus". BBC Online. Retrieved 2 March 2011. ^ "Columbus "Burned Out"". Blogs.coventrytelegraph.net. 6 July 2010. Archived from the original on 1 January 2014. Retrieved 2 March 2011. ^ "Alfonso Cuaron: the man behind the magic". Newsround. 24 May 2004. Retrieved 10 October 2007. ^ a b c d "Alfonso Cuarón Talks Harry Potter". Empire. Retrieved 6 September 2012. ^ a b c "Mike Newell on Harry Potter". Empire Online. Retrieved 9 September 2012. ^ a b c "Deathly Hallows Director David Yates On Harry Potter". Empire Online. Retrieved 9 September 2012. ^ "Heyman on directors". Orange.co.uk. Retrieved 2 March 2011. ^ Amy Raphael (24 June 2007). "How I raised Potter's bar". The Observer. London. Retrieved 12 September 2012. ^ "Harry Potter & The Order Of The Phoenix – Daniel Radcliffe interview". Indie London. Retrieved 14 September 2012. ^ "Introducing Michael Goldenberg: The OotP scribe on the Harry Potter films, franchise, and fandom OotP Film". The Leaky Cauldron. 10 April 2007. Retrieved 10 September 2012. ^ "Heyman talks adaptation". Firstshowing.net. 9 December 2010. Retrieved 2 March 2011. ^ a b "Steve Kloves Talks Harry Potter". Empire Online. Retrieved 17 September 2012. ^ "Harry Potter fans boost Oxford Christ Church Cathedral". BBC. 25 March 2012. ^ "Visitor Information: Harry Potter". Christ Church, Oxford. Archived from the original on 18 December 2014. Retrieved 5 June 2010. ^ "OSCARS: Production Designer Stuart Craig — 'Harry Potter'". The Deadline Team. Retrieved 20 March 2015. ^ "HARRY POTTER Studio Tour Opens in 2012". Collider.com. Retrieved 13 September 2013. ^ a b "From Sketch to Still: From Marbling Gringotts to Painting Diagon Alley, How Harry Potter's Art Direction Earned Its Oscar Nod". Vanity Fair. 14 February 2012. Retrieved 10 September 2012. ^ a b c "Drawn to cinema: An interview with Stuart Craig". Beat Magazine. 30 October 2010. Archived from the original on 24 December 2013. Retrieved 30 September 2012. ^ Ryzik, Melena (7 February 2012). "Harry Potter and the Continuity Question". The New York Times. Retrieved 10 September 2012. ^ "Tech Support Interview: Stuart Craig and Stephenie McMillan on a decade of designing 'Harry Potter'". HitFix. 10 September 2012. ^ : Rosi (1 March 2010). "Delbonnel on Potter". 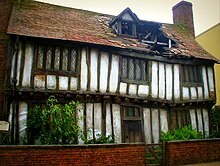 The-leaky-cauldron.org. Retrieved 2 March 2011. ^ "Bruno Delbonnel talks shooting Half-Blood Prince to mark Oscar nomination". Mugglenet. Retrieved 29 September 2012. ^ "Bringing a Wizard's Dark World to Life". The Wall Street Journal. 19 November 2010. Retrieved 30 September 2012. ^ "A Wizard Comes Of Age". Retrieved 29 September 2012. ^ a b "Kodak Celebrates the Oscars® Feature: Harry Potter and the Deathly Hallows – Part 1". Kodak. Archived from the original on 25 May 2013. Retrieved 29 September 2012. ^ "Deathly Hallows to Be Shot Using "Loads of Hand-Held Cameras," Tom Felton Talks Sectumsempra in Half-Blood Prince". The Leaky Cauldron. 31 March 2009. Retrieved 31 March 2009. ^ "Lensers aren't afraid of the dark". Variety. 12 December 2012. Retrieved 30 September 2012. What I loved about the last film is that David pushed me to go dark, which all cinematographers love to do. And usually you're fighting with the producers (about the look) but they all wanted it dark and atmospheric, too. ^ MuggleNet (19 January 2010). "CONFIRMED – Desplat for DH". Mugglenet.com. Retrieved 2 March 2011. ^ "Pope on Desplat's HP7 Pt.1 Score". Snitchseeker.com. 28 August 2010. Retrieved 2 March 2011. ^ "Alexandre Desplat – Composer of Part 1 and 2 (NOTE: Click "About the Movie", then "Filmmakers", then "Alexandre Desplat")". Harrypotter.warnerbros.com. Retrieved 2 March 2011. ^ MuggleNet (12 November 2010). "Yates on Williams, Part 2". Mugglenet.com. Retrieved 2 March 2011. ^ "Framestore - We are Framestore. Extraordinary images, extraordinary talent". Framestore. ^ "Cinesite, HP 1–7". Cinesite.com. Archived from the original on 18 December 2010. Retrieved 2 March 2011. ^ "June 2010 Filming completed". Snitchseeker.com. 12 June 2010. Retrieved 2 March 2011. ^ "10 Years Filming – 24Dec2010". Snitchseeker.com. 21 December 2010. Retrieved 2 March 2011. ^ MuggleNet (21 December 2010). "JK Title reveal". Mugglenet.com. Retrieved 2 March 2011. ^ "Harry Potter and the Order of the Phoenix (2007)". IMDb.com. ^ "WB Name Drops Big Titles". ERCBoxOffice. 23 February 2009. Archived from the original on 26 February 2009. Retrieved 3 March 2009. ^ "DH Part 1 and 2 in 3D and 2D". Snitchseeker.com. 19 November 2010. Retrieved 2 March 2011. ^ "Part 1 Not in 3D". Cinemablend.com. 8 October 2010. Retrieved 2 March 2011. ^ Gottfried, Miriam (8 August 2016). "Why Harry Potter Is NBCUniversal's Chosen One". The Wall Street Journal. Retrieved 8 August 2016. ^ Flint, Joe (8 August 2016). "NBCUniversal Places Big Bet on 'Harry Potter,' 'Fantastic Beasts'". The Wall Street Journal. Retrieved 8 August 2016. ^ "Harry Potter Films Get Darker and Darker". Wall Street Journal. 18 November 2010. Retrieved 9 September 2012. ^ "Harry Potter: Darker, Richer and All Grown Up". Time Magazine. 15 July 2009. Retrieved 9 September 2012. ^ "Review: "Harry Potter" goes out with magical, and dark, bang". Reuters. 6 July 2011. Retrieved 9 September 2012. ^ "Isn't It About Time You Gave The Chris Columbus Harry Potter Films Another Chance?". SFX UK. 3 December 2011. Archived from the original on 24 December 2013. Retrieved 9 September 2012. ^ "Potter Power!". Time For Kids. Archived from the original on 20 January 2007. Retrieved 31 May 2007. ^ Puig, Claudia (27 May 2004). "New Potter movie sneaks in spoilers for upcoming books". USA Today. Retrieved 31 May 2007. ^ "JK "loves" Goblet Of Fire movie". CBBC. 7 November 2005. Retrieved 31 May 2007. ^ Rowling, J. K. "How did you feel about the POA filmmakers leaving the Marauder's Map's background out of the story? (A Mugglenet/Lexicon question)". J. K. Rowling Official Site. Archived from the original on 6 August 2011. Retrieved 8 October 2007. ^ "Harry Potter and the Sorcerer's Stone (2001)". Rotten Tomatoes. Retrieved 1 December 2013. ^ "Harry Potter and the Sorcerer's Stone (2001): Reviews". Metacritic. Retrieved 29 June 2009. ^ a b c d e f g h "Cinemascore". Cinemascore.com. Retrieved 21 February 2015. ^ "Harry Potter and the Chamber of Secrets (2002)". Rotten Tomatoes. Retrieved 1 December 2013. ^ "Harry Potter and the Chamber of Secrets (2002): Reviews". Metacritic. Retrieved 29 June 2009. ^ "Harry Potter and the Prisoner of Azkaban (2004)". Rotten Tomatoes. Retrieved 29 September 2013. ^ "Harry Potter and the Prisoner of Azkaban (2004): Reviews". Metacritic. Retrieved 29 June 2009. ^ "Harry Potter and the Goblet of Fire (2005)". Rotten Tomatoes. Retrieved 1 December 2013. ^ "Harry Potter and the Goblet of Fire (2005): Reviews". Metacritic. Retrieved 29 June 2009. ^ "Harry Potter and the Order of the Phoenix (2007)". Rotten Tomatoes. Retrieved 1 July 2016. ^ "Harry Potter and the Order of the Phoenix (2007): Reviews". Metacritic. Retrieved 29 June 2009. ^ "Harry Potter and the Half-Blood Prince (2009)". Rotten Tomatoes. Retrieved 1 July 2016. ^ "Harry Potter and the Half-Blood Prince (2009): Reviews". Metacritic. Retrieved 17 July 2009. ^ "Harry Potter and the Deathly Hallows - Part 1 (2010)". Rotten Tomatoes. Retrieved 1 December 2013. ^ "Harry Potter and the Deathly Hallows: Part I (2010): Reviews". Metacritic. Retrieved 1 December 2010. ^ "Harry Potter and the Deathly Hallows - Part 2 (2011)". Rotten Tomatoes. Retrieved 1 July 2016. ^ "Harry Potter and the Deathly Hallows: Part 2 (2011): Reviews". Metacritic. Retrieved 11 July 2011. ^ "Harry Potter franchise to get Outstanding BAFTA award". BBC Online. 3 February 2011. Retrieved 3 February 2011. ^ a b "American Film Institute". afi.com. ^ "BAFTA Honors John Lasseter and David Yates 11/30". Broadway World (Los Angeles). 28 June 2011. Retrieved 28 June 2011. The worldwide success of Mr. Lasseter for Walt Disney and Pixar Animation Studios and Mr. Yates' contribution to the final four parts of the 'Harry Potter' franchise makes them global wizards in their own right, and are delighted to honor these remarkable filmmakers with this year's Britannia Award. ^ "John Lasseter and David Yates set to be honored by BAFTA Los Angeles". Los Angeles Times. 28 June 2011. Retrieved 28 June 2011. ^ McNamara, Mary (2 December 2010). "Critic's Notebook: Can 'Harry Potter' Ever Capture Oscar Magic?". Los Angeles Times. Retrieved 6 March 2011. ^ "Potter Oscar Magic". Thespec.com. 26 November 2010. Retrieved 2 March 2011. ^ "BAFTA Film Nominations 2001". British Academy of Film and Television Arts. Archived from the original on 21 September 2010. Retrieved 21 October 2010. ^ "Past Saturn Awards". Academy of Science Fiction, Fantasy & Horror Films. Archived from the original on 12 May 2011. Retrieved 21 October 2010. ^ "6th Annual Excellence in Production Design Awards". Art Directors Guild. Archived from the original on 8 September 2015. Retrieved 21 October 2010. ^ "2001 Broadcast Film Critics Choice Award Winners and Nominations". Broadcast Film Critics Choice Awards.com. Archived from the original on 15 February 2012. Retrieved 19 October 2010. ^ Pryor, Fiona (28 September 2007). "Potter wins film awards hat-trick". BBC Online. Retrieved 29 September 2007. ^ "Nicholas Hooper nominated for "World Soundtrack Discovery Award"". HPANA. 7 September 2007. Archived from the original on 11 September 2007. Retrieved 8 September 2007. ^ "FILM AWARDS NOMINEES IN 2008". BAFTA. 16 January 2008. Archived from the original on 8 February 2008. Retrieved 4 February 2008. ^ "Film Awards Winners: 2010". British Academy of Film and Television Arts. 21 January 2010. Archived from the original on 28 February 2010. Retrieved 4 May 2010. ^ Orange British Academy Film Awards in 2010 – Long List. Retrieved 5 May 2010. ^ "Saturn Awards 2011 Nominations". Saturn Awards. 24 February 2011. Archived from the original on 29 October 2005. Retrieved 29 March 2011. ^ "Empire Awards 2011 Best Fantasy Film". Empire Awards. 28 March 2011. Retrieved 29 March 2011. You must excuse the absence of David Yates; he'd love to be here but he's putting the finishing touches on our epic finale, which is why I'm here. ^ "Saturn Awards 2012 nominees". The Academy of Science Fiction Fantasy & Horror Films. Archived from the original on 13 June 2011. ^ "Harry Potter becomes highest-grossing film franchise". The Guardian. UK. 11 November 2007. Retrieved 17 November 2007. 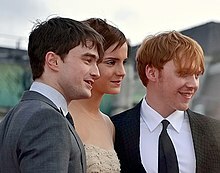 ^ ""Harry Potter and the Deathly Hallows – Part 2" Crosses $1 Billion Threshold" (Press release). Warner Bros. Pictures. 31 July 2011. Retrieved 31 July 2011. ^ "All Time Worldwide Box Office Grosses". Box Office Mojo. Retrieved 29 July 2007. ^ "Harry Potter and the Deathly Hallows – Part 1 Conjures International Box Office Magic, Becoming Top Earner of Entire Film Series" (Press release). Warner Bros. Pictures. 9 March 2011. Retrieved 11 March 2011. ^ "Box Office Mojo". Box Office Mojo. Retrieved 11 March 2011. ^ Etan Vlessing (3 October 2016). "'Harry Potter' Movies Returning to Imax Theaters for One Week". The Hollywood Reporter. Retrieved 3 October 2016. ^ a b "Harry Potter and the Philosopher's Stone – Foreign Box Office Data". The Numbers. ^ a b c d e f g h i j k l m "UK Highest Grossing Movies". 25thframe.co.uk. Retrieved 17 December 2010. ^ a b c d e f g h Collett, Mike (22 July 2011). "Harry Potter movies earn $7 billion". msnbc.com. Retrieved 10 December 2011. ^ a b "Harry Potter and the Chamber of Secrets -Foreign Box Office Data". The Numbers. ^ a b "Harry Potter and the Goblet of Fire -Foreign Box Office Data". The Numbers. ^ a b "Harry Potter and the Order of the Phoenix -Foreign Box Office Data". The Numbers. ^ a b "Harry Potter and the Half-Blood Prince (2009)". Box Office Mojo. Retrieved 1 December 2009. ^ a b "Harry Potter and the Half-Blood Prince – Box Office Data". The Numbers. Retrieved 11 December 2009. ^ a b "Harry Potter and the Deathly Hallows Part 1 (2010)". Box Office Mojo. Retrieved 17 December 2010. ^ a b Frankel, Daniel (17 November 2010). "Get Ready for the Biggest 'Potter' Opening Yet". The Wrap. Retrieved 21 November 2010. ^ a b "All Time Box Office Adjusted for Ticket Price Inflation". Box Office Mojo. Retrieved 10 December 2011. ^ a b "Harry Potter and the Deathly Hallows Part 2 (2011)". Box Office Mojo. Retrieved 10 December 2011. ^ "Harry Potter Moviesat the Box Office". Box Office Mojo. Retrieved 28 November 2016. ^ Summer 'Potter' Showdown Box Office Mojo. Retrieved 18 September 2011. ^ a b "The Harry Potter economy". The Economist. 17 December 2009. Retrieved 19 July 2017. ^ Claudia Puig (13 July 2011). "How 'Harry Potter' magically changed films". USA Today. Retrieved 19 July 2017. ^ Graeme McMillan (9 January 2015). "Splitting Tentpole Movies in Two Doesn't Make Them Any More Epic (Opinion)". The Hollywood Reporter. Retrieved 19 July 2017. ^ Costance Grady and Aja Romano (26 June 2017). "How Harry Potter changed the world". Vox. Retrieved 19 July 2017. ^ "Harry Potter". "FanFiction.net. Retrieved 17 January 2018. Wikimedia Commons has media related to Harry Potter films.